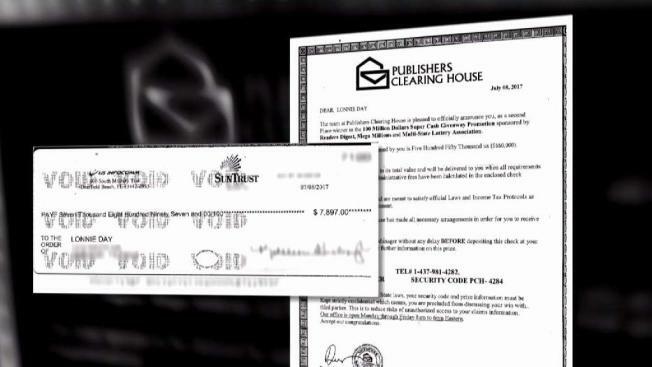 Publishers Clearing House is a real company with legitimate sweepstakes, but imposters are using this prize of a lifetime to trick consumers in a scheme that is making its rounds in North Texas. A 79-year-old viewer named "Lonnie" told us he received a letter in the mail saying he won $550,000 and he couldn't believe it. He also received a check for nearly $8,000, which was supposed to cover legal and administrative fees. The letter told him to call the claim manager before depositing the check for further instructions. Lonnie became suspicious and wanted us to look into this before he made his next move. And folks, we're here to tell you that this is fake. • Publishers clearing house will never ask you to pay a fee to collect a prize. In fact, no legit prize promoter will ever charge you to win. • If you're ever lucky enough to win, that prize patrol will show up on your door step. They won't send you a check. • If you're ever asked to send money to collect a prize, report it to the FTC.